While around 1 per cent of the world’s entire population is currently displaced, including 22.5 million refugees, our awareness, and care for, their plight seems to fluctuate with the news agenda. History may look back on this period and wonder how it could have been ignored. Our journalist Ella Rhodes spoke to a psychosocial worker working at the heart of the crisis in Greece and to psychologists who are trying to unravel why our empathy only stretches so far. Zarlasht Halaimzai is Executive Director of the Refugee Trauma Initiative (RTI), the only organisation focused on providing psychosocial support to refugees in Greece; she told us about her work. Since March 2016 the NGO has managed to provide psychosocial support to more than 2000 vulnerable people and is now hoping to raise funds to hire new therapists to continue its work. 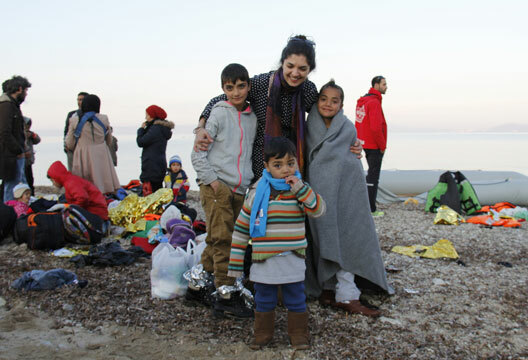 Halaimzai, who set up the NGO with colleagues after travelling to Greece to help refugees arriving on Lesbos, was herself a refugee as a child after her family was forced to flee Afghanistan and the horrors of civil war when she was 11. She and her family spent the next four years travelling without a secure or permanent home through Central Asia and Europe – always with the hope they could return to Afghanistan and continue their lives; but after the Taliban took over the country it became impossible to return. Currently around 60,000 people in Greece are awaiting the results of their asylum applications, most of those refugees have been through many camps and continue to be moved around, causing further uncertainty. Some of the refugees have been given temporary housing, but after six months they will be expected to find their own accommodation. To make matters worse, most of the larger NGOs, including Médecins Sans Frontières, International Rescue Committee and Save the Children, are downscaling their operations in Greece or leaving altogether as many reach the end of emergency funding. The RTI helps to set up safe spaces in the refugee camps in Greece where men, women and children can talk with a trained psychologist or therapist about anything they like. They use a group approach, art and music activities, and help empower people to find solutions to their own problems. The RTI therapists also work as advocates for the refugees when they hear about provisions in camps or shelters that may be lacking, or as mediators between the refugee communities, service providers and the Greek government. The RTI has set up a Go Fund Me page to raise £50,000 to help hire two more therapists, with a specialism in child development and trauma, to be based in Northern Greece. Fathers are a particularly overlooked group in such work, so Halaimzai is hoping to hire one male practitioner to help fathers of refugee families cope from day to day. RTI is also always seeking experienced volunteers who can commit to at least four weeks in Greece to work with refugees and provide training for volunteers and aid workers. Many psychologists are working towards a solution to just this problem: How can we make such enormous issues trigger empathy in individuals and policymakers? More than two years after the horrifying photograph of three-year-old refugee Alan Kurdi lying dead on a Turkish beach brought about a wave of compassion and charity donations, the refugee crisis is now rarely featured in the main news agenda – at least in the Western world. In an interview in Vox Brian Resnick spoke to psychologist Paul Slovic (University of Oregon), whose work has asked why the world ignores mass atrocities and mass suffering. While humans are excellent at sympathising with the plight of individuals, as the number of affected people rises we grow increasingly detached. This phenomenon, named psychic numbing by Slovic, even applies when the number of victims rises from one to two. - Find more on refugees in our archive.